What do you do when you feel gloomy? When you think your only state of mind is perpetual cheerlessness? When your whole countenance remains frozen in this doleful expression? That is what the pout-pout fish is experiencing when we first meet him. I spread the cheery-cheeries all over the place. 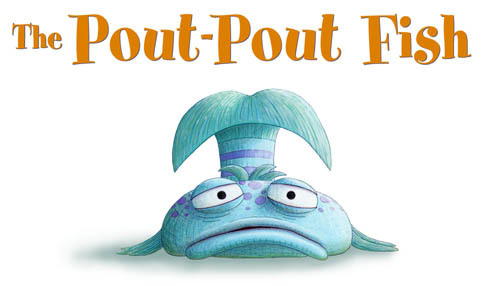 The Pout-Pout Fish is a treat to read aloud. The rhyming text with repetitive refrain makes this ideal for the toddler in residence, not to mention the colorful and playful illustrations by Dan Hanna. There is quite a bit of drama with exaggerated expressions in the cartoonish rendering of this simple little fish and his pals. Plus plenty of opportunity to render the "Blub, Bluuub, Bluuuub" in comical tones with the little ones joining in the chorus. While not every word in the book would make sense to a typical toddler, the underlying message that all it takes is for someone to share a hug, a kiss, a smile, a kind word to turn your frown upside down easily comes across. Deborah Diesen's page with additional resources for this book is quite wonderful. 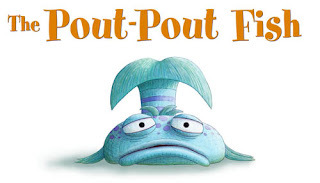 We read the recent sequel by the same team, The Pout-Pout Fish in the Big-Big Dark which talks about dealing with fear (of the dark) and overcoming it to help someone in need. After falling in love with the first book, I was steeling myself for a let down, but, not so at all. The sequel is every bit as wonderful! wow. I think I will never forget the cover picture of that pout-fish! Nice pick Sheels, enjoyed reading your review. The fish’s expression is priceless! Nice blog Have you feeling good after reading it. This sounds delightful and less direct than what we read recently - What are YOU Grumpy About? What a simple theme, and capitalizing on the pout - sweet! Neat pick Sheela.